India is an increasingly dynamic player in the modern digital economy, but many thousands of poor and rural communities still have their lives and work dictated by the rhythms of the sun and the moon. A lack of access to affordable energy means sundown equals shutdown, a loss of productivity, efficiency and valuable income. “No light means we cannot continue to work after sunset. This means less income, and often we cannot afford to eat on the next day”, in the words of Santokben, an artisan from the village of Bakutra in Gujarat. To break this cycle, the grassroots trade union SEWA (Self- Employed Women’s Association) has been working since 2009 to promote its “Green Livelihoods Campaign” – known as “Hariyali” in the local language – to provide cheap access to sustainable energy across India. 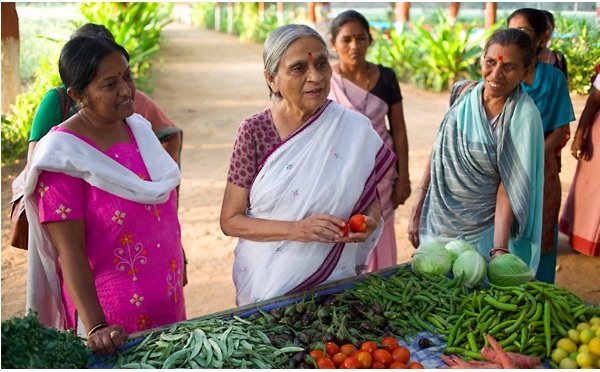 SEWA, founded in 1972 by Elder Ela Bhatt, has argued for decades that access to energy is vital in emancipating communities and especially women who are otherwise marginalised both economically and politically. n practice, portable solar LED lanterns and clean cooking stoves are provided to SEWA members, paid for by instalments. SEWA has negotiated an unsecured bank loan of Rs 250 million ($4.2 million) from an Indian private bank to provide this service to its members. Underlining the complex nature of its work in a country as vast and diverse as India, SEWA has identified three major challenges which highlight the importance of listening to local communities and learning from their own needs and experiences. It aims to raise awareness, for example of how to use more efficient and healthy cooking stoves; to determine availability so the right sort of stove is delivered to the right people (ie, the stove made for the South Indian population who mainly eat rice isn’t suited to those who eat roti in North and Central India); and guarantee affordability by closely working with local communities and financing partners. SEWA has also developed “Project Urja” to provide solar lights to women’s self-help groups across the deprived Bihar-Mungar region using a special “energy loan product” in cooperation with India’s Ministry of Rural Development. By February 2013, 177 LED lights had been provided to seven villages, meaning that children could study after dark, the women could cook better meals at night and they could also charge their mobile phones. For Ela Bhatt, this is a shining example of how innovation and cooperation can transform lives and raise communities out of poverty. Do women have a special role in poverty reduction? According to the target articles (below), as well as many other economic analyses and reports, the key to poverty reduction is the education and employment of women and their actions for economic justice.